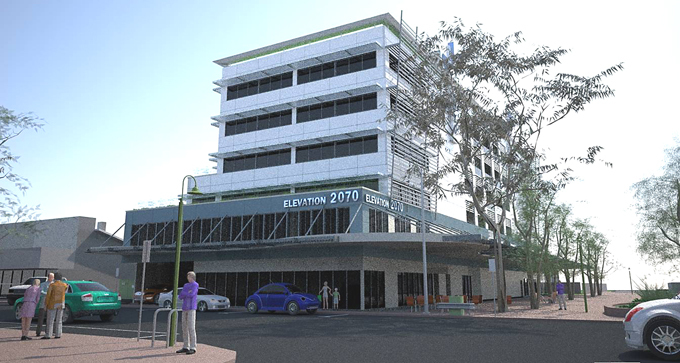 It’s back to the drawingboard for the high-rise building planned for the former Commonwealth Bank site in Parsons Street, says Sitzler Brothers general manager in Alice Springs, Trevor Jacobs. He says the firm had applied for six storeys but only five have been granted. Mr Jacobs says the company is now re-assessing whether the reduced size is economically viable. The Exceptional Development Permit for five storeys will lapse in two years. Conditions include a roof garden to enhance the view of the building’s from the town’s hills and a pedestrian-friendly awning. The ground level ceilings are to be 4.5m high and the car park on level two is to have minimum ceiling height of 3.1m “to facilitate further adaptive re-use”. • An “active facade treatment” for the side facing the laneway to the west, between the building and the post office. • future maintenance of the rooftop landscaping, and surface finishes in order to enhance the building’s visual impact when viewed from the town’s surrounding hills. • Airconditioning condensers are to be appropriately screened from public view, and located so as to minimise thermal and acoustic impacts to the satisfaction of the consent authority. • Pipes, fixtures and vents … must be concealed in service ducts or otherwise hidden from view. The permit says “external appearance of the building is expected to enhance the street scape by incorporating a large awning canopy wrapping around both key frontages providing all weather protection for pedestrians. Another reason why the Territory, Alice in particular, has struggled to survive under this Labor Government. Absolutely no guts! No vision! Heads buried so deep in their own nightmarish bureaucracy, so isolated from the general community, the only voice they hear is that of disaffected winging lefties motivated by an ideology based on envy, intent on placing as many obstacles as possible in the path of progress. To knock back, or to place such conditions that it amounts to the same thing, a project like this, at a time when our economy is literally gasping for air, can only be seen as either deliberate or grotesquely incompetent sabotage of our town’s economy. When the Town of Alice was established it was driven by economics! By what people could afford! We used corrugated iron, homemade bricks, rammed earth, the cheapest possible designs. This is the “look”, the supposed “heritage”, that government and a few recalcitrant morons are supposedly trying to protect at the expense of our entire economy. We have a planning regime so stringent, so time consuming that it has brought our town to its knees. Projects are stifled before they stand any chance of getting off the ground, as we have seen with the Melankas, and several other large economy driving developments. At a time when people are losing faith, losing their belief in the future that our town offers, these projects are of immense importance, because they lead the way. When we see someone prepared to invest large sums into our town it renews our belief in it, gives reassurance to other investors who have been holding off. It leads to a more positive mindset which in turn leads to more investment. That is why, when a long-term company like Sitzeler Bros, who have grown up with our town and are part of its history, and are very much aware of all its frailties, are prepared to lead the way, then every effort must be made to assist them to do so. That effort must include bending or changing the rules if necessary doing everything we can to expedite the project because without these projects we won’t have a town to protect. The buildings of any period can only ever reflect the economy of the times in which they are built. They must be viable. Planning decisions must reflect that viability. We simply cannot build to the idealistic whims of a small delusional minority. Looks Outback, Looks Australian. Go for it.